"If another storm comes through, we're going to die. There's no money left here." 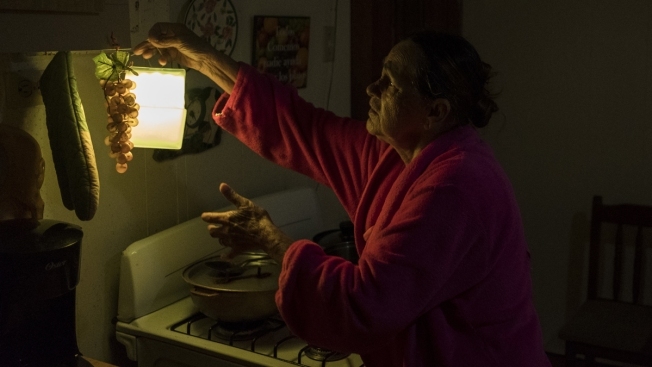 In this July 12, 2018 photo, Marta Bermudez Robles, 66, hangs a lamp in her kitchen in Adjuntas, Puerto Rico, at her home that is still with electricity since Hurricane Irma and Maria. 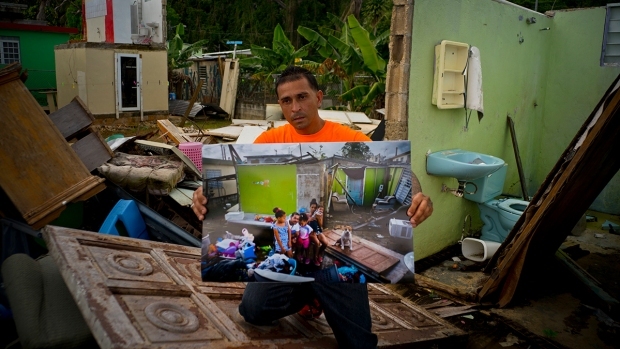 The only power Bermudez and her husband have had for 10 months is courtesy of a neighbor who threw over an extension cord connected to his generator that provides just enough power to light one bulb in the kitchen and another in the living room for a couple hours each day. It was finally a night to celebrate in Adjuntas, a village tucked into the mountains of central Puerto Rico. And even as TVs glow into the night and people like 20-year-old delivery man Steven Vilella once again savor favorite foods like shrimp and Rocky Road ice cream, many fear their newly returned normality could be short-lived. 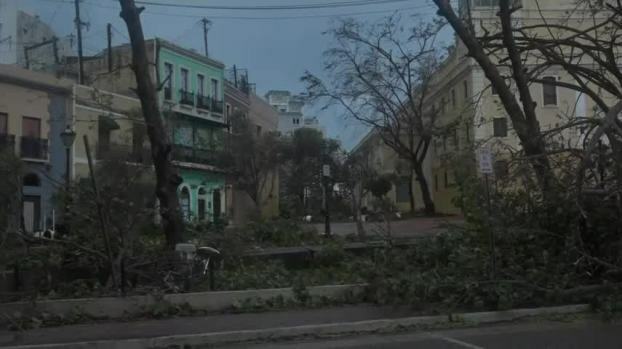 Turmoil at the island's power company and recent winds and rains that knocked out electricity to tens of thousands of people at the start of the new hurricane season have them worried. "If another storm comes through, we're going to die. There's no money left here," said 66-year-old Marta Bermudez, who still has a blue tarp over her rusting zinc roof. She doesn't believe the government has enough resources to properly rebuild the power grid amid an 11-year-old recession. Puerto Rico's electrical grid is still shaky after Hurricane Irma brushed past the island as a Category 5 storm last Sept. 6 and then Hurricane Maria made a direct hit as a Category 4 storm two weeks later, damaging up to 75 percent of transmission lines. A further complication is the lack of leadership at Puerto Rico's Electric Power Authority, which has seen four directors since Maria, the most recent one lasting only a day in the job. The turnover comes as federal and local officials try to strengthen the power grid in the middle of a new hurricane season and as Puerto Rico's government prepares to privatize the generation of electricity and award concessions for transmission and distribution. The changes at the power company, which include the resignation of five board members Thursday after the governor criticized a $750,000 salary for the newest CEO, are not a surprise to Juan Rosario, the board's former consumer representative. "The best thing to do when a boat is sinking is to jump into the water," he said. Still, despite the instability at the power company and their worries over the power grid's ability to survive this year's hurricane season, Puerto Ricans in the remote areas that recently had electricity restored are happy they can go back to their previous lives and no longer have to drain savings to fuel generators. For the first time in 10 months, retiree Ramon Serrano watched the 11 o'clock news on a recent weeknight and was at peace knowing the insulin he depends on was safe in a cold refrigerator. He went to bed at midnight with his wife. 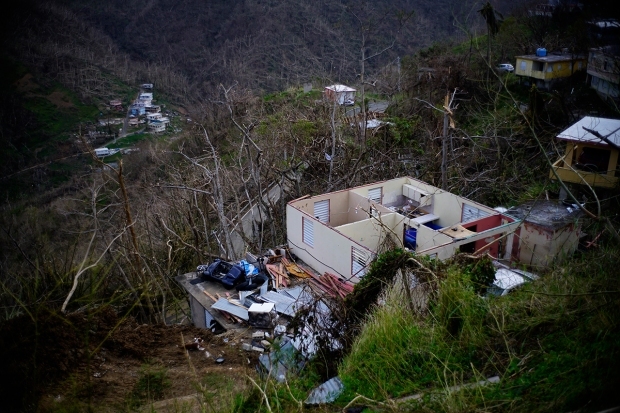 "It's the latest we've been up," said the 77-year-old Serrano, who lives in Adjuntas. Mayra Natal, a 47-year-old housewife, said she left Puerto Rico in February to live with relatives in New Jersey for four months because she couldn't take being without electricity anymore. She returned in May thinking power would be restored soon, only to spend two more months without it despite promises from power restoration crews. "They kept saying, 'Next week, next week.' And that's what it's been like until now," she said. He hasn't had power since Hurricane Irma and burned through more than 200 candles until a group of volunteers gave him solar lamps this past Tuesday after navigating their way up a steep road filled with deep holes. "I'm going to turn that on and dance a little from happiness," he said.